Lauan (meranti) plywood for use as a flooring plywood underlayment: Lauan (meranti) plywood has often been used in the past as a vinyl flooring plywood underlayment. 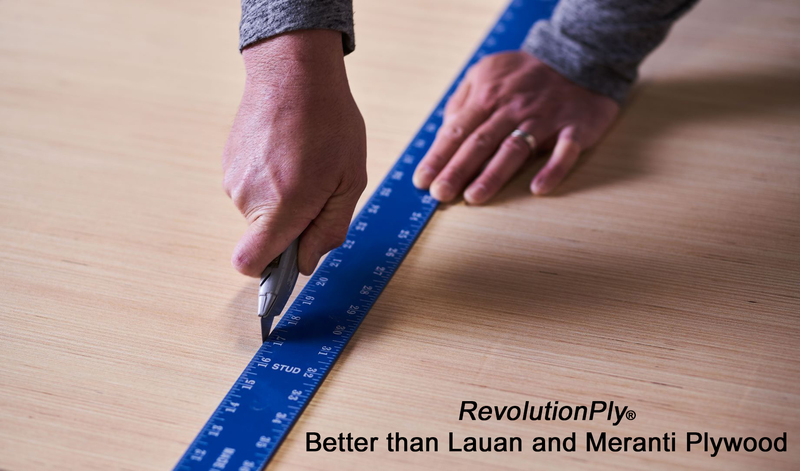 RevolutionPly® plywood is a better alternative to Lauan (meranti) as a plywood underlayment. Today, Lauan (meranti) plywood is inconsistent in appearance and often comes from poorly managed forest sources. RevolutionPly® plywood is consistent from sheet to sheet and comes from plantation and sustainable wood sources. See our website at www.RevolutionPly.com for more details and our flooring plywood underlayment installation guide. Lauan (meranti) plywood for use in the construction of furniture, cabinetry, and millwork: Lauan (meranti) plywood has been a traditional material used for furniture, millwork, and cabinetry applications. As the quality of Lauan (meranti) plywood has declined, it has become a less consistent and reliable product. RevolutionPly® plywood has uniform color and straight grain for ease of cutting, scoring, and finishing. RevolutionPly® plywood is consistent from sheet to sheet. These characteristics make it better than Lauan (meranti) plywood for use in furniture, cabinetry, and millwork. Lauan (meranti) plywood for use as wall paneling: Lauan (meranti) plywood has been used as wall paneling for the same reason it is used in the manufacture of cabinetry and furniture. RevolutionPly® plywood, with its straight, uniform grain and consistent color, is a better product than Lauan (meranti) plywood for wall paneling. Lauan (meranti) plywood for use in woodworking projects: Over the years 1/4" Lauan (meranti) plywood has been the go-to panel for various woodworking projects. RevolutionPly® plywood is a great choice instead of Lauan (meranti) because it is uniform in color, easy to cut, sand, and finish. RevolutionPly® plywood is the ideal Lauan (meranti) plywood replacement for woodworking projects. RevolutionPly® plywood is a multi-purpose panel substitute for Lauan plywood/Meranti plywood that covers a variety of uses without negatively impacting the world's rainforests. For more information please visit www.RevolutionPly.com. Call Us 336-299-7755 or Email Us for sales and technical information. RevolutionPly® panels are protected by issued and pending US and foreign patents, including U.S. Patent No. 8,414,996.